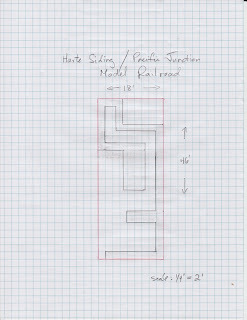 Harte Siding Model Railroad: The Plan. The layout room will be on the second story of the workshop. For the most part it will be an around the room layout,i.e. following the outside walls around the perimeter of the room with two peninsulas into the centre. Approximate size will be 18' x 46' or about 800 sq.ft. I will be utilizing open grid framework, primarily using 1x4's, with the exception of the main peninsula which will be 1x6's. For the sub roadbed there will be 1/2 inch plywood attached to the open grid and screwed down. The height of the roadbed will be 45 inches from the floor. Width will be 20" to 24" along the mains. A couple small sections will have 36" wide roadbed, where there is access from both sides, and the main large peninsula will be 60" or 5' wide. The large peninsula will no doubt present some challenges for 'reach in', however that's still only 30" from aisle side so will still be doable. Gray shaded area is benchwork. On the aisle way side of the benchwork will be a 7" wide fascia screwed to the 1x4's. The benchwork legs are made up of 1x6's ripped in half and then the 4 foot pieces will be glued together to form an 'L', then bolted to the inside of the 1x4's. At present time this will be constructed as a point to point layout as opposed to continuos or round and round. As point to point best simulates what the prototype railroads operate. 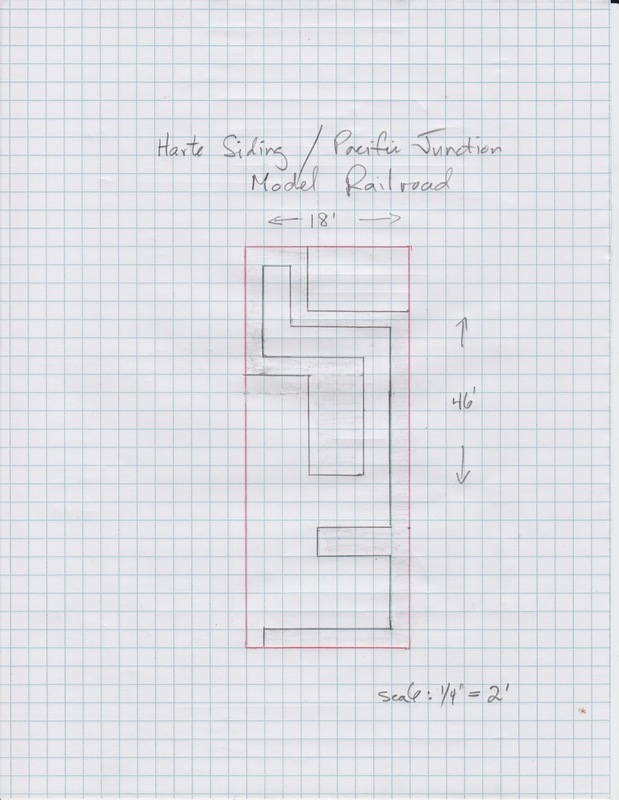 As previously mentioned I will be modelling the CNR Hart siding and Carman Jct trackage as it would have looked from the early to mid 70's thru the early 2000's. I realize this is a huge time span, but this will be a photo freelance or freelance...I don't know what or how to label it precisely. This represents the time that I was most familiar with the railroad and it's operations. 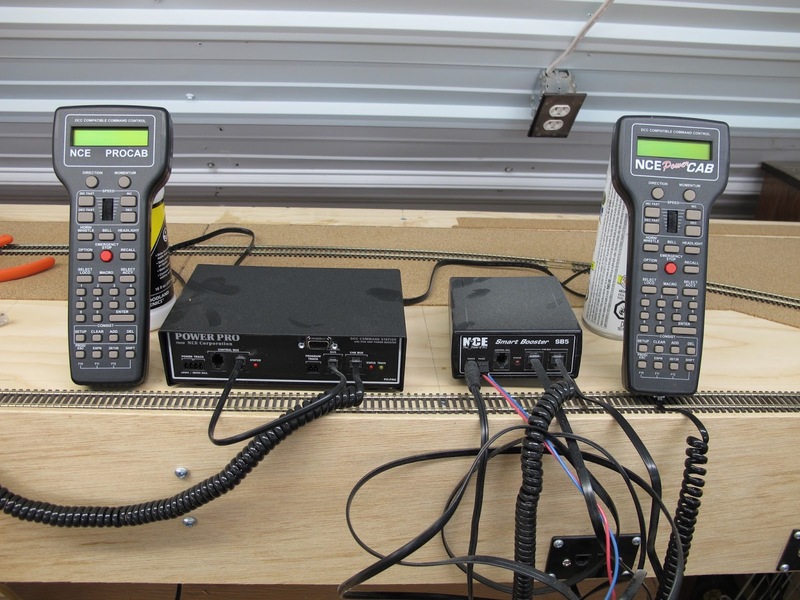 Locomotive control will be NCE wireless radio controlled DCC (digital command control), using Power Cab and Pro Cab throttles. This will be a 5 amp system, with several isolated blocks or divisions. NCE Power Cab and Pro Cab 5 amp system.